In collaboration with the companies “Rostelecom”, “Megafon” and “Rosinzheniring” V-LUX has realized big projects on infrastructure handling for television broadcasting from Olympic Sochi in 2014. 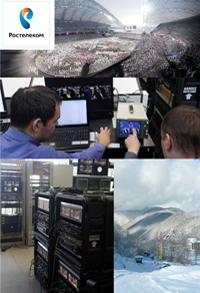 V-LUX has supplied mobile complexes for the Olympic Games broadcasting in Sochi. On the whole V-LUX supplied OAO “Rostelecom” with 11mobile video sharing complexes for HD-SDI studio signal with video broadcasting via SDH networks in H.264 HD format (coding profile 4:2:2, 10 bit). 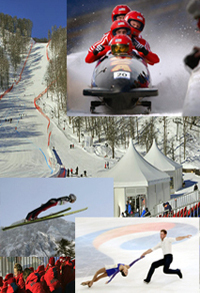 The realization of this project by V-LUX allowed smooth direct pickup of the events of the Winter Olympic Games. The mobile complexes for Olympic broadcasting were adjusted to broadcast from sport objects located in the regions with adverse climatic conditions: low air temperature, atmosphere pressure bumps and so on. Together with ZAO “MegaLabs” (comes into “Megafon” Group of Companies) V-LUX realized the project on transmission of TV content in HD format under OTT (Over the Top) technology for Megafon subscribers within the Olympic Games 2014 broadcasting in Sochi. V-LUX supplied the equipment and software, arranged its installation and start-up work and integration of different component of the solution. Under this project OTT transcoders produced by Envivio and the system of TV streams reservation by Harris/Imagine were used. 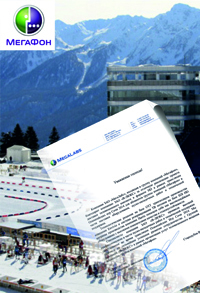 As per the request of “Rosinzheniring-automation” for Olympic Sochi there was supplied the equipment for fiber-optic networks and cable TV produced by companies Aurora Networks и Triax.